Thanks for a wonderful year! Please note that we’re closing in a couple of months. That means you have to figure out what on Earth to do with your kids during the day. We’ll be back in business mid-January. Good luck! The awesome school you decided to send Kai to. I’ve been given this suggestion by quite a few of you when I’ve asked for ideas for date weekend with the hubby. I think it’s a great idea better suited for a family day out. We did this once when Kai was about 9 months old, and we’ve been meaning to do it again. So pick your spot; Zoo Lake, Botanical Gardens or a quieter more private place like your in-laws big garden, and get to packing what you’d like to have. The bigger areas are great as many of them have play areas for the kids to be social )read: tire themselves out). Keep things simple and get your kid to help pack the bag: finger (and toddler-friendly) foods and eats that don’t need to be warmed up are perfect. Think pasta salads, sandwiches, fruits and juice bottles. I say bottles instead of boxes because your indecisive little one can always continue drinking after and doesn’t have to commit to finishing the box right there and then. In this heat, a cooler bag is ideal to keep your stuff chilled and refreshing. Don’t forget the blanket to sit on, extra baby wipes and sunscreen! We were gifted a baby paddling pool for Kai’s first birthday, and have never used it. We have a pool in our complex, and have never used it. Joburg is boiling and toddlers love water but Kai can’t swim yet, so I want to set up his little paddling pool in our garden and add a little (but in his eyes, massive) extra something: bubbles. I got this idea when he was at his grandparents and they kept him entertained for hours by making mud pies with Grandpa. His Gran said they used to just use dishwashing liquid and water back in the day to keep my hubby and bro-in-law busy. Dishwashing liquid will dry his skin out like crazy, so I’ll just add some drops of his baby wash (we’re currently using Baby Dove Head to Toe wash in Rich Moisture) to the water. Sometimes, it’s just the little things that can create a memorable, fun day. I’m pretty sure he’ll love this one! If you don’t normally read to your child, maybe use these holidays to start. As you know, I’m a huge believer in the magic of reading and it makes for one of our favourite bonding time between both me and his daddy. So we already do this, but it’s always reserved for Kai’s bedtime routine and is a quiet, peaceful time. A few weeks ago, I randomly took a book out onto our garden, placed a blanket down and read with him. He absolutely loved it. It was the middle of the afternoon, the dogs were hanging out with us and it wasn’t to calm him down and sleep. He was more active, and participated in the story more – even making up some of it as we went along. It made me realise that a little change in how we do things can be a nice surprise. So, I’m looking forward to grabbing a whole bunch of books and reading with him for longer this time. I saw this the other day and I just thought it was so simple and sweet. As parents, especially as moms, especially as a mom with control freak tendencies, we sometimes get stuck because we’re always the ones coming up with how to spend our day. Why not let Kai let me know what he wants to do that day? And then, actually do it if it’s doable. Of course, going to Space on a helicopter is a bit out of pocket for me. So I’m banking on some sensible suggestions, which he’s done before: he’ll let me know he wants to go and see his grandparents, or hang out at the shops – doing groceries is a nicely productive little outing for him. 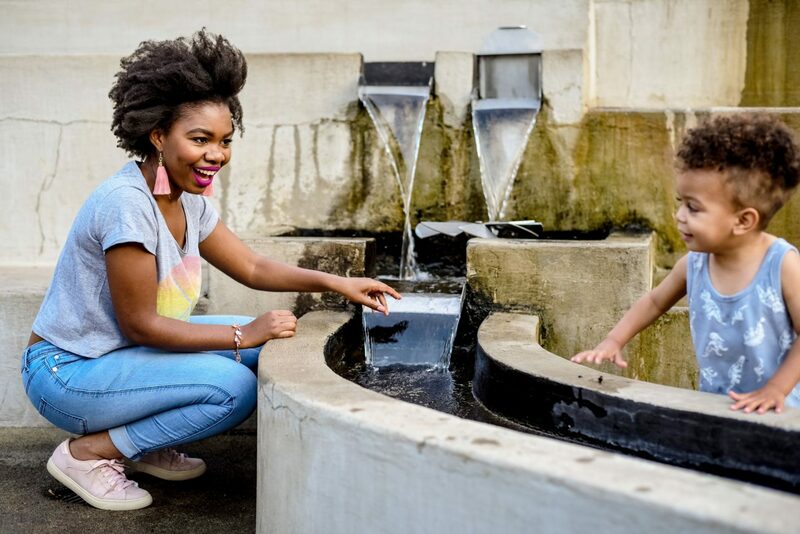 Mall of Africa has a great, big outdoor space at the top with a play area, grass and a fountain by the restaurants. 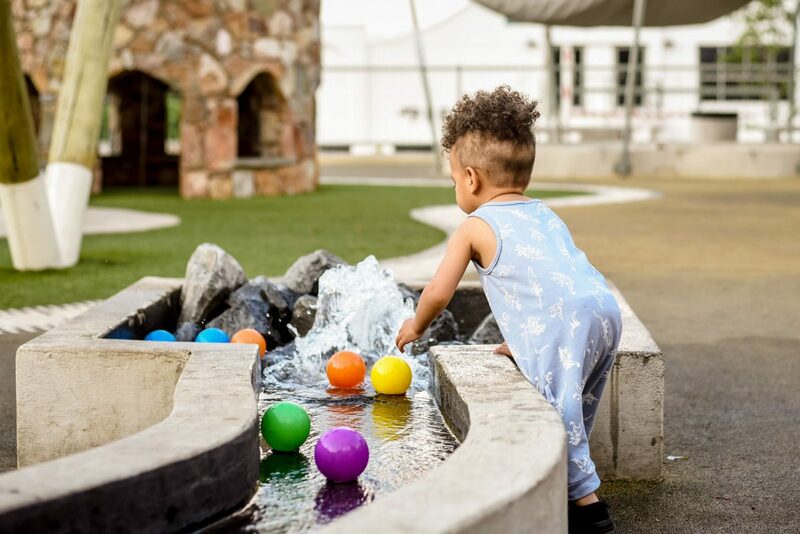 We also recently had a play date at 27 Boxes in Melville (our fave family hangout) and just watched the kids entertain themselves at the fountain with other children. What is it about kids and fountains? You may need to buy something from the surrounding stores or restaurant but you can keep it simple to save cash. This one definitely needs a change of clothes ready in the nappy bag! I hope my little list of activities has helped you with some ideas on how to entertain your toddler. Please share yours below. Either way #TrustYourWay and know your mama inspiration will kick in when you need it! In partnership with Baby Dove South Africa.